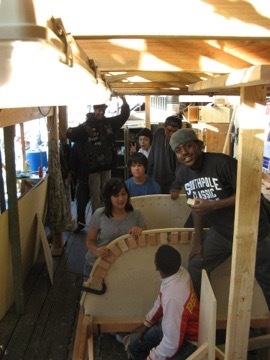 I volunteered in this ongoing program at the Spaulding Wooden Boat Center in Sausalito. 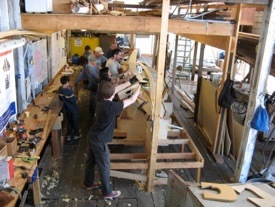 Last term we worked with a group of high school students in building and learning to sail the 1923 Myron Spaulding design lapstrake catboat, Spaulding 16. 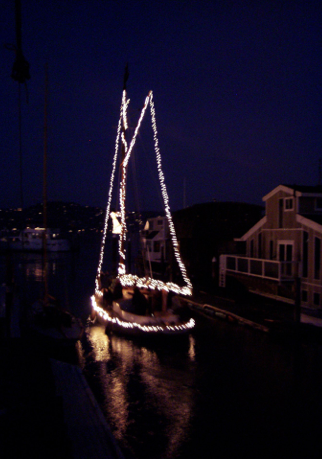 Myron’s design was drawn as a buildable boat by Tom Wylie and Doug Frolich. This is an ongoing program in its fourth year. 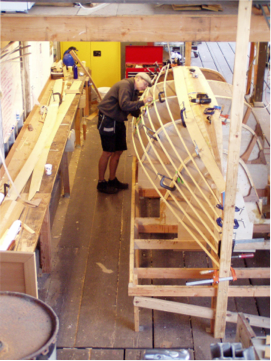 We built on our first Spaulding 16, but our third boat. 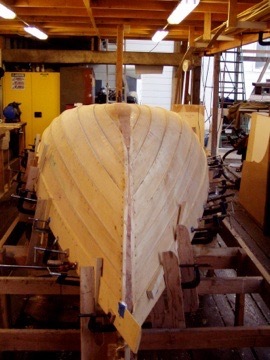 The first two boats were Norwegian Prams designed by Simon Watts. Inka laying out the plank lines. Photos by: Andrea Rey (Associate Director of the Spaulding Center), Craig Southard (Youth Program Director) and John McCormack. Angel wearing Myron Spaulding’s hat. Myron founded Spaulding in 1951.